*Yoga 910, For Yoga 910 users, please ONLY plug the adapter into the White USB-C female port. If your device is not in the list, please don't hesitate to contact us. 3.If you have any question, please don't hesitate to contact us. ▶ USB C to RJ 45 Gigabit Ethernet Adapter COMPATIBLE WITH: MacBook Pro 2017/ 2016, Surface Book 2, Retina MacBook 12" 2015 / 2016, Chromebook Pixel 2015, Dell XPS 13 & 15, HP Spectre x360 13" & 15", Lenovo Yoga 900 & 910 & 920, ThinkPad P50 & P70 and more Thunderbolt 3 and USB-C laptop. ▶ HIGH SPEED ETHERNET: Gigabit Ethernet port provides a super fast network speed up to 1000Mbps (1 Gbps) bandwidth, downward compatible with 10 Mbps /100 Mbps. ▶ Easy to Use: No installation Software required for Mac OS, Windows 10 or Linux systems. 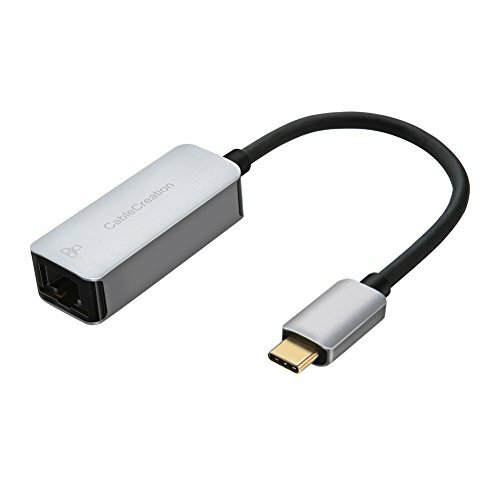 Enables immediate Internet connectivity to your Thunderbolt 3 or USB-C laptop. ▶ Wireless Alternative for connecting to the Internet in Wi-Fi dead zones, streaming large video files, or downloading a software upgrade through a wired home or office LAN; USB Type C to RJ45 is an ideal solution for transferring files from a Windows PC or an older Mac to the new 2017 MacBook using the Migration Assistant; USB 3.1 to Ethernet adapter provides faster data transfers and better security than most wireless connections. ▶ We love our CableCreation products, and hope you will too. This product is backed with 24 months product warranty as well as friendly lifetime technical support.